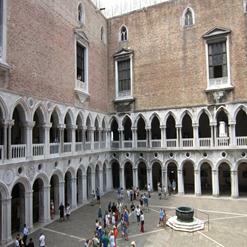 Saint Mark's Basilica is on the Piazza San Marco and is one of the highlights of a visit to Venice. As with most churches in Italy, you must be dressed appropriately to be allowed in; this means no short skirts or bare shoulders. You are not allowed to carry large bags or rucksacks inside. You must deposit them just round the corner from the main entrance. Filming and photography is forbidden so be prepared in advance.